Now this one, I really loved. What do you do with all of those old letters sitting in a box somewhere? Well, hopefully they are digitized and filed away safely on a portable hard drive. But then the originals, what do you do with those? What about frame them? (under archival glass so that they are protected from the sun and spaced away from the glass so that they don't get stuck together.) This is an idea from Pretty Stuff by Patterson Maker's tumblr and it's a beauty. There is just something about seeing the curve and tilt of someone's handwriting. In this day and age, with digital screens and endless fonts, it's rare to see anything handwritten. But so many years ago, letters were the text messages and Facebook posts. Can you imagine placing several handwritten letters around your home for visiting family to look over and read? And, if you are one of those who has more letters than you really know what to do with, follow the advice from the paragraph above and give the completed frames away as heirloom favors to your family members (after you have digitized them for your own records, of course). This would also make a stellar Christmas gift, if you're looking for ideas. Sharing a physical piece of family history with your loved ones in a beautiful manner-- say it with me: Two birds, one stone. AND a twinge of gratitude. Definitely. Do you use a specific set of dishes each year when your family comes for dinner? What about if you shake things up this year? Family story dishes are easy to make and would create some great dinner time dialogue! I pinned it but I can't find the direct source of this idea, only a media cached picture. However, these days I think we are all familiar with the Sharpie on Dollar Store dishes DIY craft. If not, here are several tutorials here, here, here, and here. (To name just a few.) 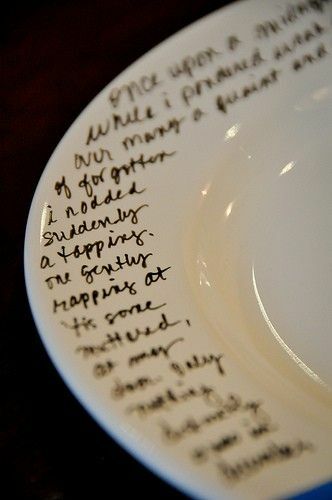 The general idea would be for you to write family stories on your dinnerware and then set the table with these dishes. Or, an even better idea is to use this year as your prep year and have the dishes ready and have everyone write their family story/memory on a plate or mug and then use them next year. *The only side note on this is that this craft is a fickle one. It works for some and not for others. Michelle did this once for a secret sister gift for her daughter to give away and had one failed attempt and one successful one. You can read her personal experience tip here. * Family stories recorded in a unique way and a conversation starter. Go ahead, say it for me. Don't you feel better? 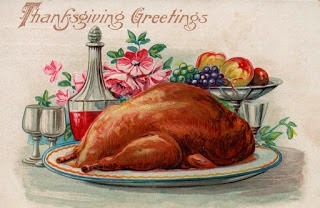 And finally, I am absolutely going to do my best to do this one for my Thanksgiving gathering. The original idea came from a guest spot by Giana (of Chic Celebrations) on the wedding planning/idea blog Ruffled and can be adapted for any kind of gathering. Naturally you'll want to make copies of your precious photos for this project. But it's so doable, anyone can whip this up in a short time. It's also a great activity to include your children in (choosing the photos, handing you the photos in whatever order they like, etc). A strip of muslin, family photos (post cards, letters, paper momentos; the list is endless), and a hot glue gun. Seriously a no-brainer project that will knock the socks off of your dinner guests! And can you imagine the conversations this beauty will start? An easy and meaningful centerpiece for your holiday gathering. Two birds, one stone. And I'd say just a smidgen more than a twinge of gratitude on this one.